1 What Is Levothroid For? 2 Who Can Take Levothroid? Levothroid is a type of drug prescribed for thyroid replacement therapy. It replaces the body's T4 hormones in the event of hypothyroidism and keeps the body's hormone levels in balance. People suffering from hypothyroidism have the option of taking natural supplements or prescription medication such as Levothroid. Levothroid contains synthetic levothyroxine or T4 sodium, which is identical to the T4 hormone being produced by the human thyroid gland. The medication is designed to replace or make more thyroid hormones in the body, especially when the thyroid gland cannot provide enough or produce any. Generally, the thyroid gland produces thyroid hormones, which are important for your body’s wellness. However, there are some conditions and situations that can lead to low thyroid gland production or ultimately stop the thyroid gland from producing thyroid hormones. When this happens, it is important to replace or add to the production of thyroid hormones, and this is where Levothroid comes in. Levothroid or levothyroxine sodium is regularly prescribed for primary, secondary and tertiary hypothyroidism caused by functional deficiency, an absence of a part or all of the thyroid gland due to surgery or congenital defects and thyroid damage due to radiation or drugs. The medicine is also used to prevent or treat some types of euthyroid goiters, thyroiditis and as part of therapy for radioiodine treatment or surgery. Levothroid can be taken by anyone needing thyroid hormone replacement as long as they are deemed fit by their health care provider. The full replacement daily dose for Levothroid is around 1.7 mcg per kilogram body weight, which is somewhere around 100 to 125 mcg per day for a regular sized adult. Older patients are usually prescribed less than 1 mcg per kilogram body weight while pediatric patients are prescribed with more than the full replacement dose. The accurate dose may differ from one person to another and will depend on your age, weight, pre-existing conditions, current medications and severity of your condition. Levothroid comes in caplet forms, which also come in twelve different colors with each color having different strengths and potency. Once a specific dosage is established, you can begin therapy. Thyroid replacement therapy is done by taking the full dose once daily, preferably in the morning, thirty minutes to one hour before breakfast. The tablets are swallowed whole but in the case of children and young infants, can be crushed and combined with a small amount of water. Ideally, Levothroid should be taken the same time each day. Patients should not stop taking the medicine without consulting their doctors. Thyroid replacement is a lifelong treatment, which means that you will have to take Levothroid or other levothyroxine tablets for the rest of your life. Thus, there are some things that you need to keep in mind to make sure that you get the best out of the treatment and avoid the risk of side effects. 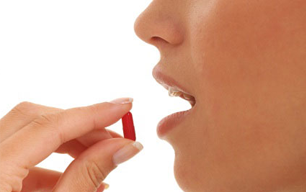 Levothroid side effects are usually caused by over-replacement or under-replacement. Over-replacement or taking too much Levothroid can cause side effects similar to hyperthyroidism. These side effects include rapid heart rate, difficulty breathing, headaches, nausea, anxiety, irritability, sweating, weight loss, sensitivity to heat and fever. Under-replacement or taking too little Levothroid, on the other hand, will cause the symptoms of low thyroid hormone levels to recur. Symptoms of low thyroid hormone levels include tiredness, muscle pain, dry skin, weight gain, constipation and the like. Because of that, it is important to make sure that you take in the accurate dose daily. If you are taking these medicines, or any other medication and substances for that matter, make sure to let your doctor know about it first. If you do take these medications, separate them from Levothroid for at least four hours. This is also the exact reason why Levothroid is taken before breakfast, so you can give your body enough time to fully absorb the synthetic hormone. Aside from telling your doctor about the medications that you take in, make sure to let him know your medical history. Make sure you disclose everything about your medical history – even those little things that you think are irrelevant. This is also very important especially if you have specific conditions that can be aggravated by the intake of Levothroid. If you do decide to conceive or if you get pregnant while on therapy, let your doctor know right away. Pregnant women may need to have their dosage increased temporarily. In case you miss a dose, take the tablet as soon as you remember. If you remember it close to the time of your next dose, skip the previous one and continue with your usual schedule. Do not take double doses unless you have word from your doctor. In case you miss two or more doses, call your doctor right away. Never do anything without the consent of your doctor. That means that you should not change doses, stop the therapy or change brands without letting him know. And lastly, of course, use the medicine only for its intended purpose.